Giveaway! Abandoned your Resolutions Already? A Bullet Journal Helps them Stick! - Susan Said... WHAT?! Everyone makes New Year’s Resolutions, from working out more consistently, to living a more organized life. But, getting Resolutions to last beyond the end of January can often be a challenge. One way to help them stick? A Bullet Journal! In Ryder’s new book, “The Bullet Journal Method,” he explains the reasoning behind each element of the Bullet Journal, such as the table of contents, events, tasks, and more. “It’s not about how your journal looks, it’s about how it makes you feel and how effective it is,” he says. Now, one lucky Susan Said… WHAT?! 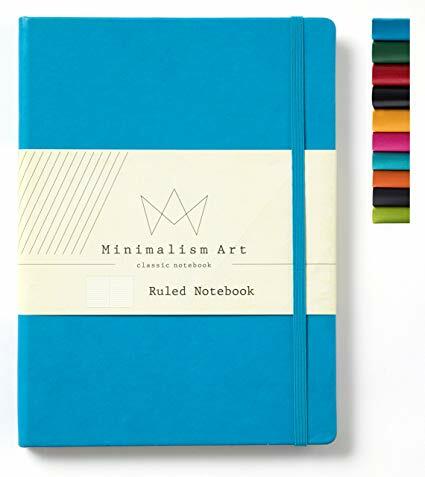 reader can win a Bullet Journal by Minimalism Art of San Francisco. This is a soft cover notebook in a beautiful bright blue PU leather that is sure to inspire some serious list-making. Its manageable size (5.8″ x 8.3″) means it’s easily tucked into a handbag. But, don’t let the small size fool you. There are here 192 lined pages (96 sheets) in thick, premium paper which can withstand ink, markers, or whatever creative enhancements you choose. Retail: $9.95 on Amazon Prime. Ready to enter? It’s a snap to enter using our Rafflecopter form below. This giveaway is available for Susan Said… WHAT?! readers in the USA, aged 18+. Odds are determined by the number of entries received. Giveaway ends February 15, 2019. Good luck! DISCLAIMER: No financial compensation was received in exchange for this Bullet Journal post. Regardless, I only recommend products or services that I believe will be beneficial for my readers. Separator image Posted in GIVEAWAYS.